Niagara Fall, ON - On Vrbica-Palm Sunday April 8, 2012 at the St. George Serbian Orthodox Church in Niagara Falls, Ontario a great celebration took place with His Grace Dr. Bishop Mitrofan: the consecration of the Icons on Iconostas. The icons were painted in Serbia by iconografer Miloje Milinkovic, who is a well known iconographer in the USA and Serbia. In the United States and Serbia Miloje has painted in several Orthodox Churches. The Icons were gifted to the Church by the Kolo Srpskih Sestara (KSS) of St. George Serbian Orthodox Church in Niagara Falls who celebrated their 75th anniversary last year. 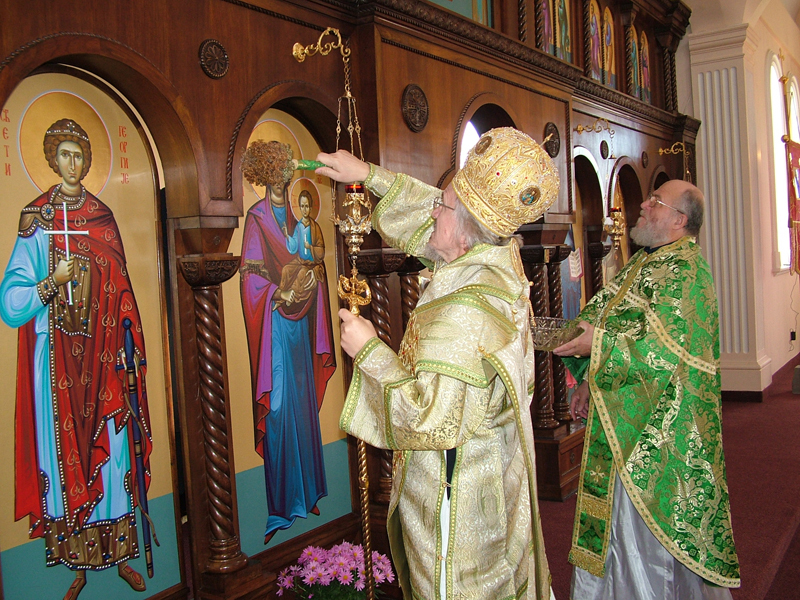 Prior to the Divine Liturgy, His Grace Dr. Bishop Mitrofan together with Father Radisha Ninkovic and our parish priest Father Dejan Obradovic consecrated the new icons on the Iconostas. Following the Divine Liturgy His Grace Dr. Bishop Mitrofan gave a wonderful and inspiring sermon regarding Palm Sunday and the meaning of Icons. A lenten meal followed which was prepared by the women of the local Kolo Sestara. During the meal president Dusan Kolundzic welcomed everyone for this unique celebration. Father Dejan Obradovic thanked God and others who assisted with the project of the new Icons. His Grace Dr Bishop Mitrofan offered kind words during the meal, stressing the need to keep unity.